Postcard to Winifred FLINT 1888-? I picked up a postcard for 99p. 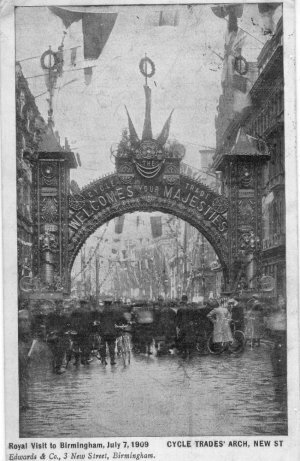 The picture was interesting, the visit of King Edward VII to Birmingham on 10 Jul 1909, and a huge arch built by the Cycle Trades to welcome His Majesty. But Birmingham is well outside my area of study. 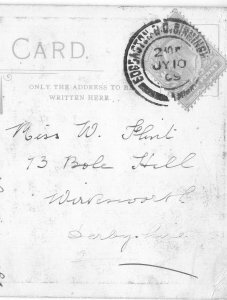 However, the message on the other side was from "Les" to a young lady called "W" who lived at 73 Bolehill, Wirksworth. Using the Census and Parish Register, I found out that W was Winifred FLINT, and I traced her family back 100 years. Amazingly, the photo was taken, the postcard printed and sold, written and posted, all in 3 days! Winifred was 21 when the postcard was sent, and "Les" seems to have been on very friendly terms with her. Les lived at 55 Latimer St, Edgbaston, perhaps he worked in a cycle factory there? I wonder if they got married after 1909? 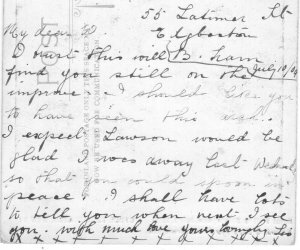 Who was "Lawson"? Perhaps some reader can fill in their history after the postcard was sent? The FLINT families: 1901, 1891, 1881, 1871, 1861, 1851 and 1841.